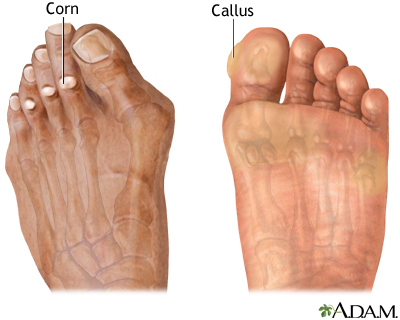 Corns and calluses form on the skin because of repeated pressure or friction. A corn is a small, tender area of thickened skin that occurs on the top or side of a toe. A callus is a rough, thickened area of skin that appears because of repeated irritation or pressure to an area of skin. Calluses usually develop on the palms of the hand and soles of the feet.